We’d love your help. Let us know what’s wrong with this preview of Mindfulness for Teen Anger by Mark C. Purcell. 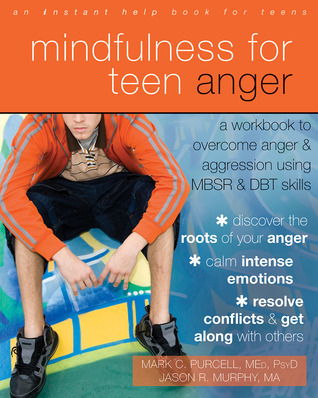 To ask other readers questions about Mindfulness for Teen Anger, please sign up. This is an excellent book. New Harbinger publishes a lot of useful and interesting books. As someone pursuing graduate degrees in counseling/psychology, I would love to have more of their books, as well as other books by Mark Purcell. They are very useful for reference in class papers and will be useful in my professional career after graduation. I would recommend Marc Purcell's and other New Harbinger books and/or other resources for anyone pursuing degrees in t I won this book from Goodreads. This is an excellent book. New Harbinger publishes a lot of useful and interesting books. As someone pursuing graduate degrees in counseling/psychology, I would love to have more of their books, as well as other books by Mark Purcell. They are very useful for reference in class papers and will be useful in my professional career after graduation. I would recommend Marc Purcell's and other New Harbinger books and/or other resources for anyone pursuing degrees in these fields, or for parents whose children (or themselves) may be dealing with a traumatic, social or psychological issue. This is a good book including different activities that help teens learn about different types of anger as well as how the seeds of anger are planted. Several of the activities focus on self-reflection and acceptance. The activities help teens learn about how to identify and respond to triggers. I sometimes have trouble convincing teens that mindfulness is worth learning. The activities are easy to rearrange and you can focus first on activities that are of more interest to the teens first. Found some of the activities in here useful for working with adolescent clients with anger issues. This book is a great tool when working with teens that have anger issues. Mark C. Purcell has definitely spent time with teenagers who have difficulties with anger and it shows. He has strategies in the book as well as worksheets. I would recommend it to anyone who has a teen in their life who might need a little help in how to deal with anger. I won this book in a giveaway by Goodreads. I'm always excited to receive books that allow me some insight to help me with my children. This book was so awesome in that it was a workbook for teens. My oldest is a tween, but this book was still applicable and useful for her. It was awesome! I won this book on first read on goodreads.com. This book was vary informative about the nature of anger and how recognize it before it can become explosive. In my opinion this book would be helpful to any age not just teens. Mark has been working in various aspects of the mental health field for over twenty years with a primary focus upon the needs of youth and families. His professional experience has ranged from providing psychotherapy to youth to developing specialized treatment programs and teaching professionals and graduate students. Mark has particular interests in Mindfulness based therapeutic approaches, such as DBT and MBSR, as well as treating trauma and substance abuse. He recently co-authored, Mindfulness for Teen Anger which integrates these interests into a self-help workbook for adolescents. In addition to teaching and writing, Mark provides therapy to youth and adults in his private practice in San Carlos, CA.